Celiac disease is a persistent intolerance to gluten gluten intolerance– a protein contained in wheat, barley and rye. Celiac disease is observed in people who are genetically predisposed to daily intake of these proteins. As a result, an autoimmune disease develops – the body’s immune system starts to attack healthy tissues – the intestinal (mucosal) epithelium. The only way how to avoid it is not to eat food containing gluten. Why is accurate diagnosis of celiac disease important? Correct diagnosis of celiac disease is important to avoid the consequences of disease. Equally important is the correct diagnosis in cases when celiac absence is established. In cases where celiac disease is proven, patients should follow a strict gluten-free diet which is restrictive and expensive (bread can cost approximately € 30 monthly). What is determined by celiac disease genetic Testing? 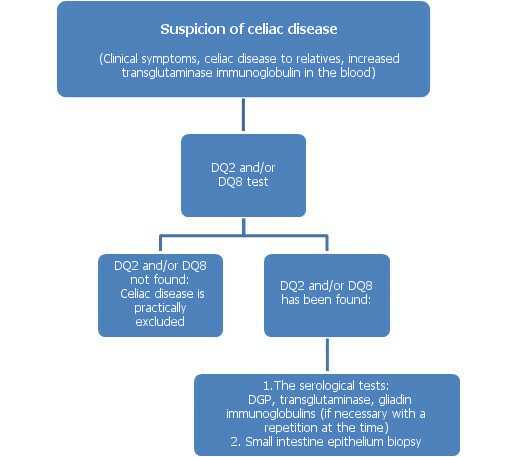 Celiac genetic testing can be performed in E. Gulbis Laboratory. The test provides information about HLA (white leukocyte blood cell antigen human leucocytes antigen) DQ2 and DQ8 gene variants showing an increased risk of developing celiac disease. These genes are a necessary but not sufficient precondition for celiac disease. These genes are found in a third of people, but their presence (existence) does not mean that the disease will develop. If these genes are not found then an individual cannot develop celiac disease. If DQ2 and DQ8 gene variants are not detected then there is almost no risk of celiac disease. It is estimated that only 1 ‒ 4% of people with DQ2 and DQ8 gene variants will develop celiac disease during their lifetime. Which people are advised to have a celiac disease test? Celiac disease test should be made to all those who for some reason there is a suspicion of the existence of celiac disease and it is recommended that these genes be tested in people whose relatives are diagnosed with celiac disease, because inheritance is present in up to 15% cases. The probability of identical twins reaches 70%. What is the recommended procedure for celiac disease testing? Genetic testing is not affected by diet. Gluten – free diet or gluten consumption does not affect the test results, while celiac antibody tests can be affected by patients’ gliadin uptake level.